We are a group of Canadians dedicated to combining forestry with conservation. 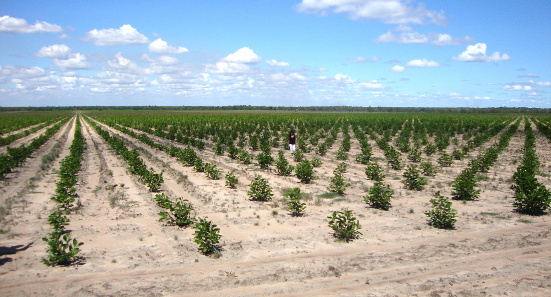 The Amazonia Reforestation project started in 2007 with the purchase of La Pedregoza, a 2,650 hectare or 6,546 acre ranch ideal for tree planting in Vichada. To date we have planted well over 1,000,000 tropical trees representing more than 40 species. The cultivations cover 1,200 hectares or 2,965 acres. Adjacent to the plantation areas, we have established and operate a 1,215 hectare or 3,000 acre natural reserve, known as the Reserva Natural La Pedregoza. The natural reserve is registered with Colombia's Parques Nacionales Naturales or national parks system and actively plants native tree species. Our company is registered with the Bogotá chamber of commerce and has a NIT or tax number of 900.154.991-1. Our audited financial affairs are reviewed annually by Colombia's Superintendencia de Sociedades. We are members of AGAF, the Vichada agroforestry association, and of Fedemaderas, the national wood industries federation. A Sustainable Forestry Management Plan or PMFS, which is the base line for FSC certification, has also been registered with Corporinoquia, the regional environmental authority. Our team and company are recognized leaders in clean agricultural and natural silviculture practices. CEO: Dexter Dombro, B.A., LL.B. Agronomist: Fidel Cano Flórez, Ing. Agrónomo. Tree Nursery: Cristian Leonardo Espinel, Tecnico Vivero - SENA. Sustainability: Dr. Kochurani Dombro, B.Sc., DDS. Besides devoting time and resources to local training and education programs, we are also well known for our student internship program, which to date has supported students doing research or thesis work from Germany, Colombia, Canada, Haiti and elsewhere. We believe that forestry and ecological research is vital if we are to truly promote sustainable practices and conservation in the Orinoco River basin. On Earth, only 10% of the trees cut down are replaced or replanted, which is clearly not sustainable. Deforestation is a leading cause of climate change. With your help our Vichada plantations can work to reverse these trends.